har jeg altså fått plass i Design Teamet til Digi Doodle Shop Challenges. Jeg har gledet meg lenge til å begynne, og nå er dagen endelig her. Ukens utfordring er "Paper Lace" og det er Team Ruth som viser fram sine kort. Gå inn å se på alle de flotte kortene som er laget og delta gjerne selv også. I have been selected to the Design Team of Digi Doodle Shop Challenges. I have been looking forward to this day for a long time, and finally it's here. This week challenge is "Paper Lace" and it's Team Ruth as show us their cards. Go to the challenge and take a look at all this beautiful cards and please come and join us. Og baksiden med mitt personlig stempel. Ukens vinner får et gavekort på $ 10 hos Digi Doodle Shop. 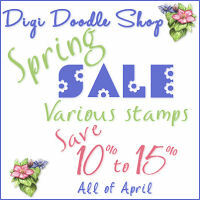 This weeks winner get a $ 10 gift certificat from Digi Doodle Shop. så ta en tur hit å se. De har mange flott stempler. so go in here to take a look. They have many beautiful stamps. Skal tilbringe helga i Steinkjer med ca 70 andre damer med samme lidenskap for papir. I have now my suitcase done, to go away for this weekend. I'm going to Steinkjer with ca 70 other ladies. We are together this weekend to make cards and layouts and different things of papers. Absolutely gorgeous, inside and out! Love your coloring, and those flowers are perfect. So glad to have you on the team! Beautiful card and wonderful coloring! Love the pretty background you used, really makes the image pop! So glad to be sharing the team with you! A super card Berit and lovely the soft colour palette. Thanks so much for joining my bingo theme at Allsorts this week and good luck with the prize draws. What a gorgeous elegant card sweetie. Sorry I'm commenting late, I've been away. Your card is really pretty, I love the delicate colours and the flower sets it off beautifully. Gillian fron Cardmadfairy's Digi days. Hi Berit, such a pretty card! Lovely image and your flower arrangement is beautiful. This turned out lovely. The colors are so soft and inviting. Love the card LO. Awesome job hun. Beautiful card, thanks so much for playing with us at OSAAT. So beautiful. Thanks for playing paperminutes this week. Oh so lovely card! Thanks for joining The Crafty Pad Challenge. Hi Berit this is gorgeous and so beautifully designed, the image and softness of the colours look wonderful, I love it.